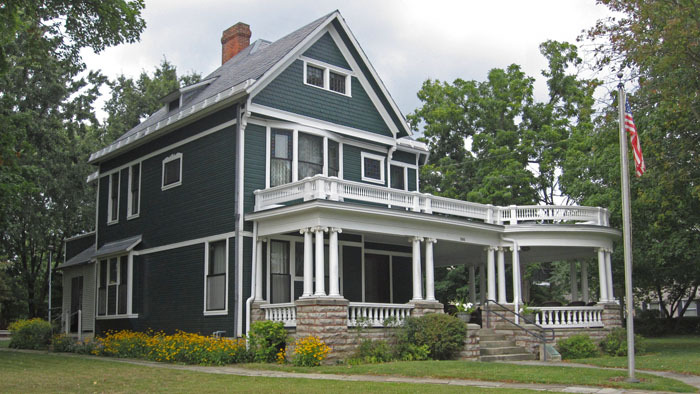 The Harding Home in September of 2014. 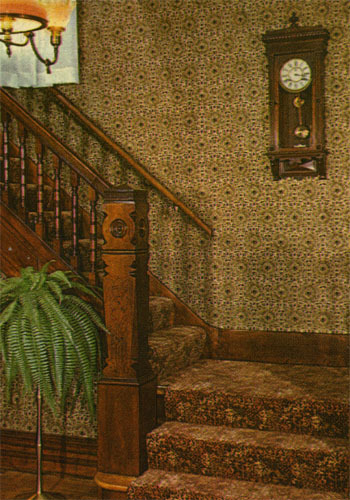 The “death clock” (as well as one of the owl-headed banister posts). According to our tour guide and the Haunted Ohio IV book, the clock, which is on the wall above the first landing of the main staircase, was a wedding gift. For years it worked perfectly, both before and after Harding’s death. However, Woodyard writes, “on August 2, 1973, at 7:30 p.m., the clock inexplicably stopped.” Coincidentally (or perhaps not), this was exactly – down to the very hour – 50 years after Harding’s death. Furthermore, Woodyard writes, “on Thursday, one week later, the clock began to run – as mysteriously as it had stopped on the previous Thursday.” When Seth asked our tour guide if the clock had stopped for anyone else since then, she said that Harding Home volunteer (and local Harding High School teacher Shannon Morris) claims to have seen it stop, though she didn’t say whether he was there to see if start again. For the record, the clock was ticking away when we saw it. Maybe a more interesting story is the one about a pet finch owned by Mrs. Harding. Actually, Mrs. Harding is the central figure in almost every supernatural story surrounding the Hardings and their home. In Haunted Ohio V Woodyard writes that Mrs. Harding believed in astrology and regularly consulted a clairvoyant named Madame Marcia. 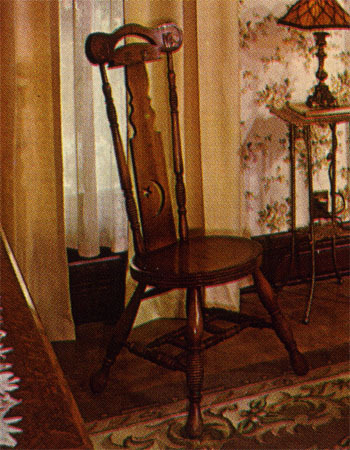 Our tour guide pointed out that the banister posts at the foot of the stairs were carved to look like owls – animals rich is supernatural symbolism – and that a chair in one of the bedrooms was known as the “medium’s chair” (though whether or not a medium actually used it is unclear). According to our tour guide, Mrs. Harding wasn’t particularly fond of Petey the finch, but since it was a gift, she felt compelled to take it. Perhaps to show her displeasure, she named the bird Petey after her ne’re-do-well first husband. Mrs. Harding would cover the birdcage with a cloth at night, and the bird would go silent. However, on the night before Mrs. Harding and her husband were supposed to depart for Alaska, the bird inexplicably began to sing from beneath his covered cage. For Mrs. Harding this was a bad omen, and rightly so. Harding died on the trip. According to Woodyard, Petey ended up out-living both President Harding and Mrs. Harding. Visitors to the Hading Home can now see Petey, stuffed and under a glass jar, in one of the bedrooms of the Harding Home. *Believe it or not, these questions are not as half-baked as they sound. As recently as 2008 the New York Times Magazine ran an article about Harding titled “Our First Black President?” Furthermore, the truTV website has an interesting article titled “The Strange Life and Death of President Harding” that touches on the blackmail that was sometimes a result of Harding’s numerous affairs as well as the possibility that Florence Harding murdered him. Finally, in their 2005 national bestseller Freakonomics, Steven Levitt and Stephen Dubner write, “By the 1920s, a revived Klan claimed eight million members, including president Warren G. Harding, who reportedly took his Klan oath in the Green Room of the White House.” Levitt and Dubner later retracted this claim since their source, Stetson Kennedy’s book The Klan Unmasked, is now generally believed to be unreliable at best and an out-and-out fabrication a worst. I saw shadow figures everywhere and when we went upstairs we heard a bird sing loud and clear. We were freaked out and all ran out of the house and I puked. I have been a tour guide at the Harding Home for 20 years. All tours are with guides at all times. At no time in the presence of any guides have there ever been sounds of a bird singing upstairs, nor have there ever been a group of tourists get “freaked out” and run out of the house to “puke”! Some people like to embellish stories or completely make them up out of thin air. But I will admit that in the year 2000, the clock DID stop on the President’s death day and time, just as the author mentioned in this story. However, it doesn’t re -start on its own; we have to re – start it ourselves. The story of the clock stopping at 7:30 on Aug 2, 1973 is not right, for it to have been at the exact hour he died 50 years earlier it would have to have stopped at 10:30 since Marion is 3 hours later than the time in California where Harding was when he died. I looked it up and he was reported to have passed around 7:30 Pacific Time just as the story says. Coincidentally on Aug 2, 1973 at 7:00 I was at the Palace Hotel in San Francisco standing outside the room where Harding had died. I was a college student at the time and couldn’t afford to rent the room or even stay at the Palace. I was a history major interested in Harding and was in California at the time so thought it would be an interesting pilgrimage to make. If I’m still around I plan to try to book the room for the 100th anniversary in 2023. I haven’t made it to Marion yet but I still hope to one day. I hope to visit the Harding Home and the Tomb. I have put together a nice little collection of Harding memorabilia as well. Mark, I’m a huge Harding fan. Would love to read what you have. Yesterday, my husband and I visited the Warren G. Harding home in Marion, Ohio. While standing on the front porch adjacent to the screen door, the door started rattling violently, like someone would try to do if they were desperately trying to get inside. Although there was a slight breeze/wind that day, it was nothing out of the ordinary, and nothing that I could figure that would be responsible for the door rattling so. It startled me quite a bit, and I jumped back with a start. Surprisingly, my husband, who was standing only a few feet away with his back to me, was completely unaware of what had just occurred, and I appeared to be the only one who was aware of it. Needless to say, this was a pretty uncomfortable feeling, and spooked me quite a bit.